''Sitalpati'' weaving from Cooch Behar district of Bengal has been recognised as an 'Intangible Cultural Heritage' by the United Nations Educational, Scientific and Cultural Organisation (UNESCO). Weaving sitalpati mats ('sitalpati' translates to 'cool mat', from the fact that it helps to keep cool, be it as a mat for sitting on or to hang on doors or windows during summer) is an age-old cultural tradition of Cooch Behar region, located in the northeast part of West Bengal. It consists of weaving together the green cane slips of the mutra plants (Maranta dichotoma), indigenous to the region. Barokodali, Ghughumari and Nakkati-Pushnadanga of Cooch Behar district are the most important centers of Sitalpati in West Bengal. Besides this is also available in states of Tripura, Assam and in the neighboring country of Bangladesh. The gradual decline of sitalpati weaving in West Bengal was arrested by the proactive efforts of the Chief Minister Mamta Banerjee to gain for it global recognition and thus, funds for its revival. As a result, Sitalpati has found a place in the UNESCO-sponsored Rural Craft Hub project, under which, at 10 locations in nine districts of the State, training and marketing centres and museums have been set up to help promote and market crafts indigenous to those regions, to national and international tourists. Chief Minister's untiring effort towards reviving the cultural heritage of the State and bringing it to the notice of the world has played a major role behind this recognition. The traditional sitalpati-weaving families usually belonging to the Kayasta caste,have earned respect and renown. Through 50 self-help groups (SHGs), promoted by the Department of Micro, Small and Medium Enterprises (MSME) of the State Government, the weavers have access to loans on easy terms. They are given training to improve on the technical and marketing aspects. 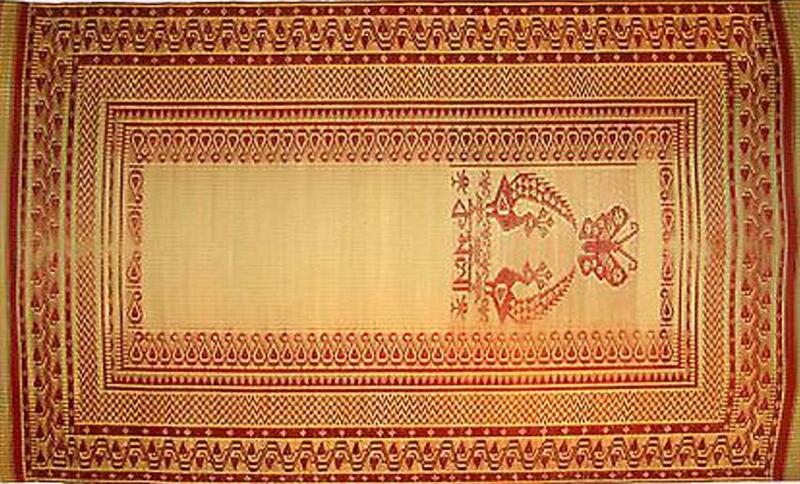 The quality of the Sitalpati mat is judged by its glossiness, smoothness and fineness of texture. The best kind of Sitalpati is so smooth, it is locally said that even a snake cannot glide over it. A museum showcasing various types of Sitalpati has been set up in Ghughumari, a well-known centre for the craft in Cooch Behar district. Importantly, the State Government is also promoting tourism centred on sitalpati. Products include not only mats but bags, purse,tablemats etc. Through these measures, the State Government is acting as a facilitator between the artistes and their crafts, and helping in bringing long-term stability to the craft and the crafts people. How Sitalpati mat is made :The green cane is soaked in water before it is slashed/sliced into thin strips for making the pati. Then the fine strips are woven by skillfully joining and interlacing to shape into beautiful mats.